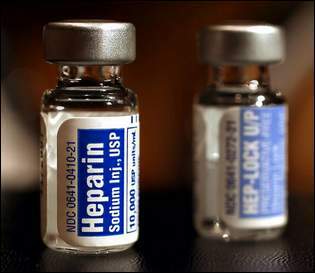 Counterfeit heparin may be responsible for at least 19 deaths in the United States and hundreds of allergic reactions. The news came from federal regulators yesterday that part of the anti-clotting drug made by Baxter was an unapproved ingredient from China that was altered to mimic the real thing. Baxter has pulled the drug from the market. In exploring the potential liability of Baxter below, I first offer up this personal background: I previously represented Timothy Fagan, a 16 year-old New Yorker who had been injected with counterfeit Epogen after an emergency liver transplant. It was one of the few counterfeit drugs cases ever brought in this country, which gives me a unique perspective on the issues that may be encountered should suit be brought against Baxter. His experience was part of a 60 Minutes segment (as well as many other news reports) and featured in a book by Katherine Eban, Dangerous Doses. Legislation named for him, Tim Fagan’s Law, is pending in Congress. I have a page at my web site devoted to the subject (Counterfeit Drug Resource Page), have written on the subject here a number of times (though not in the last nine months), and spoken at pharmaceutical conferences on the subject. Tim’s experience, like the one with Baxter’s heparin, resulted from problems in the pharmaceutical supply chain. For Tim, the counterfeiting took place after the drugs left the hands of drugmaker Amgen, and low dose vials were “uplabled” with counterfeit labels to appear to be 20x the strength, reportedly by a criminal gang in Florida. The vials were also mishandled, leading to apparent adulteration. Tracing how the drugs moved through a web of secondary wholesalers was a critical part of the investigation. Baxter now faces a similar problem of supply chain management, though the problems exist upstream instead of downstream. The problems result from outsourcing critical manufacturing to others while also failing to verify the integrity of the product. Any investigation as to Baxter liability will no doubt turn on whether the company turned a blind eye to the product’s sourcing, perhaps because the price was so good. The evidence was destroyed at the time it was injected or ingested and the packaging discarded. Doctors will generally assume that a failure to get better is the result of the underlying condition, not a counterfeit drug. Since the patient was already sick (or they wouldn’t be getting the drug), proving that death or further disability came from the counterfeit, as opposed to an underlying cardiac condition that they were perhaps being treated for, will represent a real causation issue even if you know the counterfeit was injected/ingested. The drug may not be trackable back to Baxter due to shoddy record keeping regarding the supply chain, which still contains loopholes that allow the “pedigree” of a drug to be washed by “authorized distributors of record” so that prior owners of the drug are unknown. Litigants will start with an essential fact: It is a prohibited act to sell counterfeit drugs and Baxter appears to have done just that. Most lawyers refer to that as negligence per se. Since Baxter appears to have committed that prohibited act (assuming the accuracy of press reports), it must therefore try to defend itself with a claim that the company owed no duty of care to the end-user, as there was no direct relationship between the two. Since the measure of Baxter’s duty to the end-user will be measured by the foreseeable risk, and counterfeiting is not only a clearly foreseeable risk (see the links back at my resource page), but one that has received much attention lately due to counterfeits coming out of China in particular, the foreseeability issue is easily approached. Thus, a plaintiff would argue that it is not whether Baxter owes its customers a duty of care, which has existed for decades, but rather, the scope of that duty. Baxter counsel will argue, in essence, that the company deserves immunity, and will scratch around for any argument that fits that bill. Since any case will likely be faced with a motion to dismiss right away, it is critical that each of the potential issues be addressed in the complaint with proper allegations. There are no cookie cutter forms for this type of complaint, and each of the allegations and potential responses must be thought through and specifically tailored.